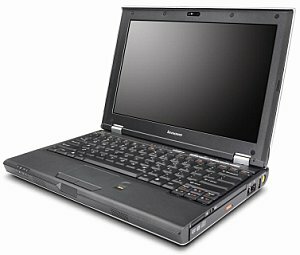 Levono V100 is a laptop computer from Lenovo 3000 series of notebook computer. Lenovo V100 ultra-portable notebook is not think though, which is 1.25-inches thick and weighs four pounds, but packs with features. The specifications feature Intel Core Solo or Intel Core Duo processor, 12.1-inch 1200 x 800 WXGA resolution LCD monitor, 5-in-1 card reader, 1.3 megapixel camera, fingerprint reader, internal CD-RW/DVD combo unit or DVD burner, integrated Wi-Fi, integrated Bluetooth, and various ports. Other than PC Magazine and Digital Trends, more reviews on Lenovo V100 are available. NotebookReview reviews Lenovo V100 and concludes that Lenovo V100 is a decent portable notebook offering and nice addition to the 3000 series. I think the key for the V100 will be pricing, the 12.1″ form factor is turning into a competitive field as is witnessed by the release of the XPS M1210 and the V100 on the very same day. If you want to have a small notebook that’s simple to carry around and still offers very good performance and attractive features, the V100 should be on your list to consider. The excellent web camera image quality, good keyboard, good selection of ports and of course the advantage of having a built-in optical drive in a 12.1″ form factor are key decision components. The V100 would fit well for a small business buyer or as a second computer in the home that can be easily carried on vacation or other trips.